Soccer was my sport of choice. Not tennis. I played the french horn, a companion instrument if ever there was one. Now, before you reach through the computer to pat me on the back because you think I’m such a giver and live a selfless life, let me tell you why I am this way. Because if I fail, I don’t want to fail alone. And if I risk, I want someone with me. It’s just plain easier that way. I never lost a soccer game and left with the weight of the world on my shoulders. Only 1/11 of the weight. But I guess the argument could be made that I only contributed to 1/11 of a victory. And that’s on a good day. It’s not that I fear the limelight. Gracious, I love being the center of attention. It’s a character flaw to be certain. Just ask… well … anyone who has ever met me ever. It’s that I hate the idea of everyone watching me and then messing up. By myself. I went to a piano concert tonight that was great. My friend Anne was awesome on Erie Canal. It took all the maturity I could muster to not sing along loudly. Of course, that’s after my friend Adam (a 10 year old) and I (a 27 year old) ran around the church trying to get lost and go through any unlocked door. But I digress….. I watched these kids walk up to the piano, sit down, and begin to play, I realized that even the shyest of the shy is still braver than yours truly. Because that kid is willing to walk up to the instrument and play without knowing how things will turn out. Sure, jr. pianist has practiced the piece until it is memorized, but there is risk in the moment. 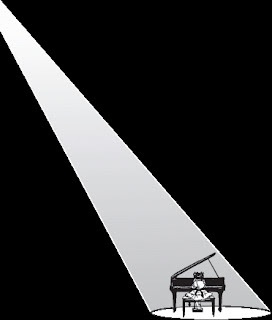 All eyes are on one person, playing one piano, and if that student messes up, everyone sees it. And knows it. Yet they go anyways. Why? I don’t know that answer. Maybe… because the music is beautiful. Because the applause is loud. Because the last note finally arrives. Because the student has worked so hard to get this far. Because they love the mix of fear and skill. Or because their name is next on the program. And, for me, the better question is HOW? How do you do that? How do you take the risk with no guarantee? I watched a television show today where a band was performing (maybe The View? ), and one guy played a guitar solo and this same question went through my mind. Is he not afraid of messing up? I wish this was one of those posts that came to a neat and succinct closing. A real zinger. But it doesn’t. Because I don’t know. What if you ARE doing it for the applause? What if people don’t like the music? Does being brave equal doing the brave thing even when scared? Or do brave people feel brave when they do the brave thing? Does a lack of courage mean the decision is wrong? Always? Sometimes? Never? I go to Nashville tomorrow. My computer is remaining in Marietta [gasp], so no blog posts until Monday, and it is mildly unfair to leave you like this, I know. But maybe this has somehow raised questions in your mind about your life that you can take to God. And get some answers. There’s a tablespoon of redemption for you in every cup of my confusion, or so I hope. I mean, who wants a holiday weekend full of questions with no promise of a clear cut answer? Apparently I do. That’s why I’m going to Nashville.